Traditional thermostats are too complicated. Homeowners find traditional thermostats hard to read, complaining buttons are too small, screens are too complex, and terminology is confusing. 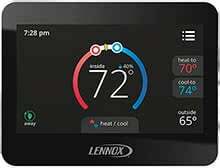 The ComfortSense® 7500 Thermostat makes programming an energy-saving schedule remarkably easy. Designed with a beautiful 4.3" touchscreen display with large font and adjustable brightness, you can see your temperature from across the room. Its easy-to-use interface has been designed to look and feel like today's tablets and smartphones, making it easier to setup a customized schedule, so you can start saving energy and money quicker. The CS7500 Series Thermostat generates Energy Reports that let you compare your monthly heating and cooling usage, allowing you to adjust your settings as needed to help reduce energy consumption and utility bills. The Smooth Setback Recovery feature on the CS7500 senses extreme temperature changes and begins the temperature recovery process up to 2 hours before the programmed time. This slow temperature ramp up not only ensures a comfortable environment when you arrive home, but saves you energy too. Universal thermostat—works with conventional and heat pump systems, supporting up to four stages of heat and two stages of cooling.